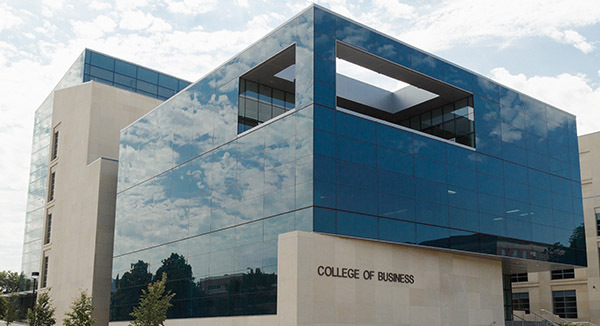 The University of Nebraska–Lincoln will celebrate the opening of the new College of Business from 3 to 5 p.m. on Friday, August 18. Students, alumni, friends and more can attend the Open for Business: Ribbon Cutting and Back to School Bash by RSVPing at http://business.unl.edu/bash. The $84 million, 240,000-square-foot building is the largest academic building project in the recent history at the University. The college is located in the center of City Campus at 14th and Vine Streets. The event kicking off the 2017-18 academic year features live music, food and drinks, prizes and a celebration of the college’s community. The bash is sponsored by Sandhills Publishing. The formal ribbon cutting ceremony takes place at 4 p.m. and includes speakers from university leadership, including Interim Dean Kathy Farrell. Farrell believes the building symbolizes the strong growth seen at the college during the past six years. Many programs and services such as the Business Career Center, Honors Academy, Clifton Strengths Institute, Executive Education and others did not exist until recent years. “The new building provides experiential learning possibilities we couldn’t accomplish in the old space. One new feature includes a 1,689-square-foot Huskers Shop, which is a merchandising partnership with Fanatics, selling Nebraska athletic gear. Our students will use data from the store in classroom settings to analyze financials, marketing trends and much more,” said Farrell. Donations from alumni built the privately-funded facility, which possesses an iconic look of sand-colored limestone and deep blue glass adjacent to Morrill Hall’s famous bronze mammoth statue and across Memorial Mall from Memorial Stadium. Alex Fernando, a senior business administration and broadcasting major from Jefferson, South Dakota, embraces the opportunity to spend his final year at Nebraska attending classes in the new building. Rik Barrera, associate dean of student services and chief operating officer, managed the building project on behalf of the college, coordinating construction with Hausmann Construction, who saw the project through to completion on time and budget. To learn more and RSVP for the Open for Business event, visit: http://business.unl.edu/bash.